Lost in Lace: new approaches by UK and international artists is a visual and sensory spectacle. Even before you enter the gallery itself and you climb the steps of Birmingham Museum and Art Gallery’s Gas Hall, you can see through the glass entrance a sparkly glimmer beyond a number of ethereal translucent paper columns. Passing under a vibrant archway of red acrylic hexagons you enter an exhibition that has already engaged you in an exploration of layers, boundaries and decisions. Lost in Lace is a partnership exhibition between the Crafts Council and Birmingham Museums and Art Gallery, in association with University for the Creative Arts. It has been curated by Professor Lesley Millar MBE and brings together twenty international artists who have been influenced and inspired by the language of lace to create works, both intricate and monumental. The exhibition seeks to question the meaning of lace in physical space as ‘stitches in the air’. Through a series of site-specific installation it highlights the architectural potential of lace. The works are sensitively and intelligently located in the gallery by exhibition designer Calum Storrie, laying the fabric of the building bare to enable the visitor to re-negotiate mysterious new environments created by each of the artists. 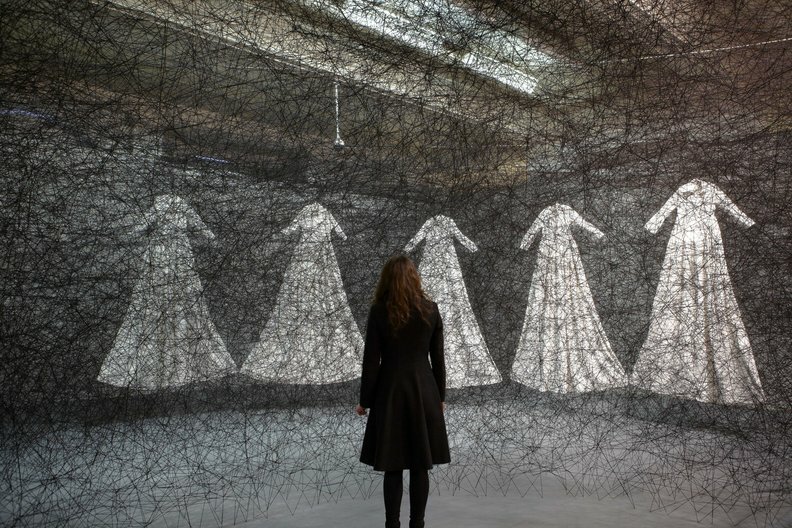 The visitor can stand in a darkened room that reveals ghostly traces of phosphorescent shapes, walk through a doorway cut out of hand-cut black muslin and be confronted with a room filled with an almost impenetrable network of black threads. Artists from Japan, Germany, the Republic of Ireland, France, Brazil, Netherlands, Panama, Italy, Norway, the U.S.A, Finland and the UK have created site-sensitive installations that explore a range of issues. From the geo-political work of Michael Brennand-Wood and Lise Bjørne Linnert, to the personal narratives of Diana Harrison and Ai Matsumoto to work by Katharina Hinsberg, Nils Völker, Tamar Frank and Atelier Manferdini that explore our physical environments. Lost in Lace is an exhibition borne out of the Fifty:Fifty Programme, through which the Crafts Council develops and delivers an ambitious exhibitions of contemporary craft with a regional venue within the UK. Lost in Lace is the inaugural exhibition to come out of this programme. Collaboration is an increasingly important, necessary and rewarding way of working for all creative and cultural bodies. It results in both financial, skill sharing, creative and critical development for all concerned with hopefully fresh, exciting and challenging results in the public domain. Lost in Lace provides the viewer with many new perspectives – not least through direct engagement with the installations but also it shows us how stories can become more potent, and their presentation more stunning, through the contemporary employment of traditional craft skills and techniques. Lost in Lace is one of the highlights of the Crafts Council’s 40th anniversary programme. Lost in Lace is open until 19 February 2012 at the Gas Hall, Birmingham Musuem and Art Gallery.